Valentine’s Day is coming up fast, but not everyone can afford an expensive fancy dinner. If your budget is tight, like mine is this year, you might be searching for other ways to celebrate. The good news is, you can show that special someone you love them without overspending. That’s right. You don’t have to buy diamonds, huge bouquets, or expensive meals to demonstrate that you care. Try some of these frugal valentine’s options instead. How often do you take the time to play with your kids? If you need frugal valentine’s options, pick one of their favorite activities or choose a new one to explore together. Lots of young children like to spend time in the kitchen. Give them a few recipes to choose from and let them run the kitchen for the day. Make sure the recipes fit your budget and that you have all of the ingredients ahead of time. Then, make inexpensive chef’s hats to fit the occasion. They’ll love being head chef, especially when the food turns out great. Hospitals and nursing homes are often full of folks who won’t get any valentines, let alone visitors. Give them both by making paper valentines with your family and then delivering them together. When was the last time you took a day off without any plans for it ahead of time? Coordinate with your spouse or significant other and take the day off together. Then, see where the day takes you. Going out for Valentine’s Day is not only expensive, it’s often crowded. Instead, do like my husband and I do. Skip the crowds and go for a cheaper option, like staying in. You can still have a date night without spending a fortune. Try eating a meal indoors on your own living room floor. Spread out a blanket and make it an inside picnic. Or buy a reasonably priced bottle of wine and a box of chocolate. Run a bubble bath and enjoy all three together with your sweetheart. Even if you’re single, there are plenty of frugal valentine’s options you could choose from to celebrate the holiday. Buy a cheap book at your local discount or second hand store. Of course, to make it one of the most frugal Valentine’s options, you can also borrow a book. Other choices are checking out a book from your local library or downloading free ones from the internet. Sometimes an old movie is just the ticket for an evening by yourself. Pop some popcorn and turn on one of the classics, like, “Sleepless in Seattle”, or “Pretty Woman”. Sometimes the best gift you can give is your time. This is one of the frugal valentine’s options anyone can take advantage of. Spend your time with loved ones or friends doing activities everyone enjoys. If you can’t agree on anything, have each person write down five ideas on small scraps of paper. Toss the slips in a bowl and have someone draw one out. That will be your activity for the day or evening. Colleges and other community organizations sometimes offer free or cheap classes. Signing up would be one of the fun, frugal valentine’s options anyone could do. Some to look for are cooking classes, yoga, pottery, painting, sewing, woodworking, and more. You don’t have to break your budget each Valentine’s Day. There are frugal Valentine’s options that let you celebrate the day without going overboard. Try volunteering your time at a local school, nursing home, hospital, animal shelter, or other worthy organization. It’s been said that you can’t buy someone’s love. If that’s true, as an alternative, you could choose one of these frugal valentine’s options to show you care. How do you plan to spend Valentine’s Day? 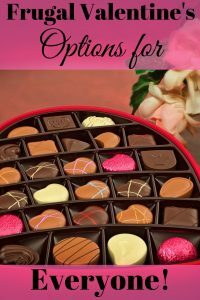 Will you choose one of these frugal valentine’s options, or one that’s similar? Going out to eat as a couple is very good! If you don’t go out to eat much it can be a real treat! Sometimes watching classics is just the ticket! It lets you see something you know you’ll enjoy without having to pay super close attention to what’s happening. That way you can cuddle while you watch and not really miss anything. Thanks for your input!